Experiencing Blue Blazes Trail on a bright and brisk sunny Sunday in January is invigorating! The trail is boggy but brief (aprox. 2-mile loop in total), so if you bundle up and wear some boots, you will certainly enjoy stomping through the swampy southern end of the Moccasin Bend National Archaeological District in the wintertime. Over the years, members of the Urban Archeology Corps and Southeast Conservation Corps have done trail maintenance and foot bridge repair along the loop, placing hardy wooden walkways in lower lying patches, especially useful during the winter and rainy seasons. Elsewhere, pine needles under your feet cushion the ground as you pass through the pine forest which is mostly dry and flat. Small shorter side trails off the main path give access to the edges of a large wetlands where you’ll see trees growing in an expansive and oddly beautiful swamp. 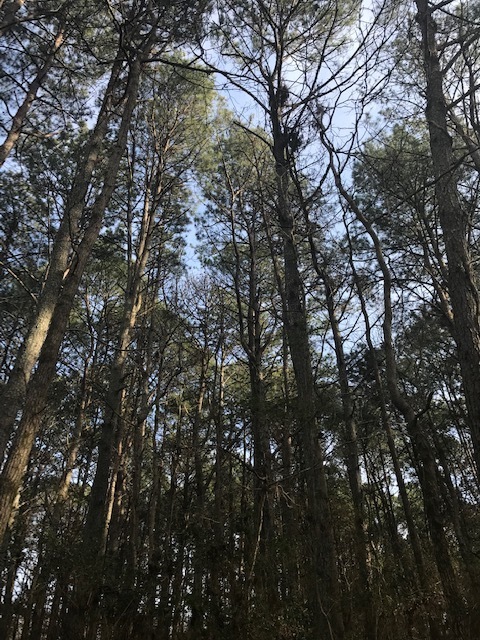 Although AllTrails recommends the months of March through November as some of the best times to visit Blue Blazes, hitting the woods in the “off season” has its advantages, including the opportunity for some easily accessible solitude while there are less visitors. These months set aside for hibernation are also a good time to notice the beauty of decay with textures and fragments of decomposing leaves creating infinite still lifes in the still season. Hiking Blue Blazes in winter also means that many of the trees and bushes along the banks of the river are bare, making the vistas from the western end of the trail not to be missed this time of year. 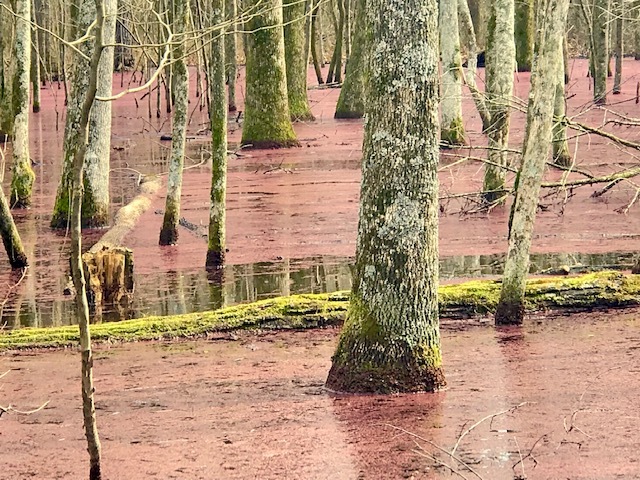 The colder weather is also the likely culprit in creating the conditions for a pink aquatic fern called Azolla to cover the surface of the wetlands, a striking otherworldly sight. A quick query on the internet and to several local naturalists yields varied speculation as to the causes of this botanical blooming event without closer observation. As you walk deeper into these woods the din of highway and city sounds disappear. Listen closely and you can hear towering trees moaning as they bend in the cold breeze. Stand quietly at the water’s edge and it’s easy to imagine other ancient sounds from the area’s prehistoric inhabitants. American Indians used then occupied Moccasin Bend through the Archaic, Woodland and Mississippian periods up until the time of the Indian Removal Act of 1838. 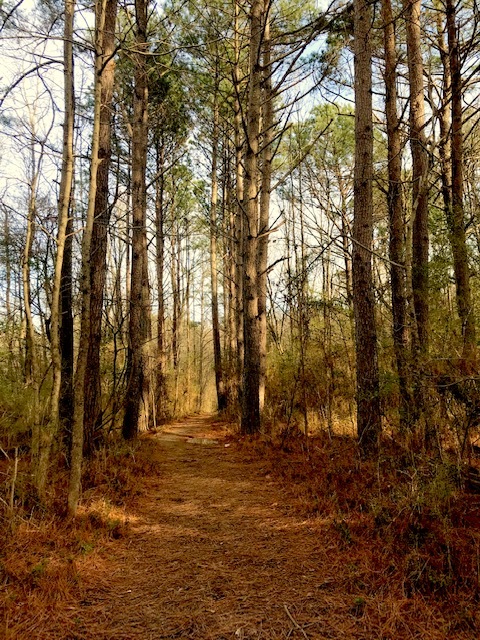 The woods we enjoy and appreciate today as a quiet place to walk, trail run and commune with nature, were once active places used by our area’s first residents to hunt for food and later, as a place to build villages and form societies along the banks of the Tennessee River. Today, the National Park Service consults with 22 federally recognized tribes in its stewardship and interpretation of the Bend. With 12,000 years of human history near this very trail and all around the Archaeological District, it is humbling to walk the paths surrounded by such significant heritage. More information on the Blue Blazes Trail can be found on the National Park Service website.